Please welcome our 4 newest Backyard Wildlife Sanctuaries! 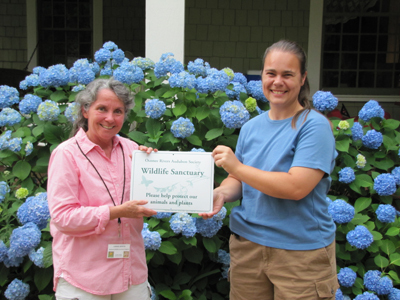 Congratulations to Lorene Winter, Deb Weiler and Loren Hunt, Judy and Richard Newton, and Chuck Murphy, who have all received Backyard Wildlife Certifications this summer! Since our program began on May 1st, we have certified 5 properties (with one additional property pending). 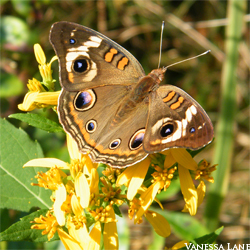 A total of 34.27 acres in the Athens area is now certified as backyard wildlife habitat! When I was little, I used to love watching fireflies on warm summer nights, catching them in my hands, and of course putting them in a jar and being mesmerized by them just a little while longer before releasing them to continue on their journey. As I grew up, I saw less and less fireflies each year until eventually I didn’t see anymore. They were all but gone from my hometown and still are except for occasional sightings outside the city limits. Later, I learned that it was probably large trucks spraying for mosquitoes throughout neighborhoods that wiped out the firefly populations. Although, the spraying stopped happening years ago, the fireflies haven’t returned. The pesticides in addition to habitat loss, light pollution, and development have all contributed to this loss. 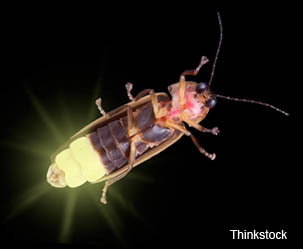 When I moved to Athens and saw fireflies in my backyard, I was overjoyed. It had been so long since I had seen them and I could not stop smiling. I sat outside every night just to watch their magical flight once again. Now, I eagerly await their return each spring. Our First Certified Backyard Wildlife Sanctuary! 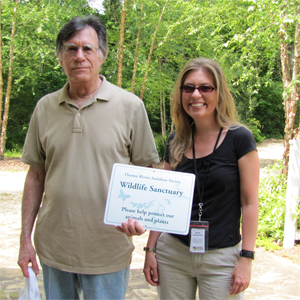 Congratulations to Leon Galis for being the first backyard to be certified as a backyard wildlife sanctuary! Leon has been improving his yard for wildlife for years by planting native species, providing fruiting trees and shrubs, and removing privet from his property. Leon also provided the initial inspiration to create the Backyard Wildlife Sanctuary program here in Athens. Six volunteer certifiers also attended to learn more about the certification process. Read more about Our First Certified Backyard Wildlife Sanctuary! The Backyard Wildlife Sanctuary Program is now up and running! We are certifying our first property this Sunday. If you would like to get your backyard certified as a wildlife sanctuary, you can download the application here! If you are interested in learning more, or would like to be a volunteer certifier, please contact our Conservation Chair, Robin Woodroof. Habitat conservation is needed to preserve Georgia’s rich butterfly heritage because butterflies depend on certain plants during all four stages of their life cycle: egg, caterpillar, chrysalis and adult. Creating a butterfly garden in your backyard can provide such a habitat while being an exciting and rewarding project. These beautiful insects will add bright colors and many hours of enjoyment to your garden. Here are some simple steps to create a successful butterfly garden. Want to enjoy wildlife in your backyard, but think you can't afford it? It's easy to feel that way when there are so many fancy outdoor items for sale with large price tags. Although those items can be enjoyable, they are not a necessity. You really don't have to spend a lot to enjoy wildlife and the more natural an area is, the more likely wildlife will feel at home. Here are a few ideas that will attract birds, amphibians, insects, reptiles, small mammals and probably a few welcomed surprises.